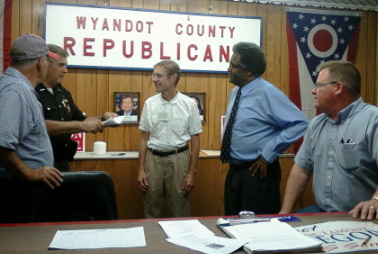 Wyandot County Republicans who made our visit to the fair a most enjoyable one. 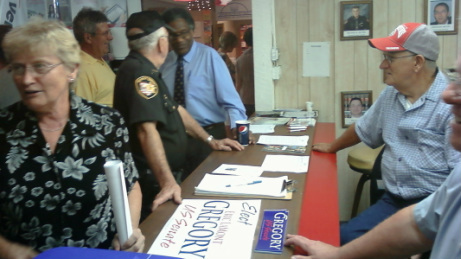 From left to right Sherman Stansbery, Chairman of the Wyandot County Republican Party, Wyandot County Sheriff Michael R. Hetzel, Wyandot County Prosecutor Jonathan Miller, US Senate candidate Eric LaMont Gregory, and Upper Sandusky City Council candidate Rick Roberts, listen as Sheriff Hetzel discusses the upcoming election. 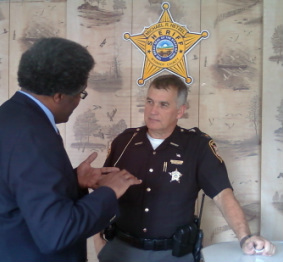 US Senate candidate Eric LaMont Gregory and Wyandot County Sheriff Michael R. Hetzel discuss the antidote approach to drug addiction as a way of coming to grips with the drug epidemic sweeping across the great state of Ohio. The current reliance on the criminal justice system in the fight against addiction ignores the fact that drug addiction is a medical problem, with promising medical interventions. 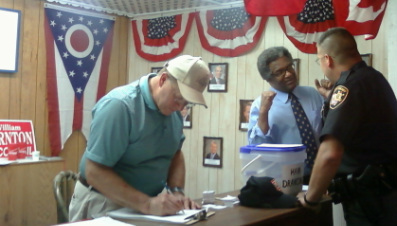 "It is the candidates that bring excitement to elections", GOP Chair DeWine stated. Wyandot County renal cancer survivor KathyLandveisicht, we spoke of the need to launch an effort, a ten year effort much like that that put a man on the moon to conquer cancer. US Senate candidate Eric LaMont Gregory is committed to such an effort. US Senate candidate Eric LaMont Gregory, a graduate of the Faculty Board of Clinical Medicine at Oxford, believes that it is the destiny of this generation to conquer cancer. If we can explore the outmost regions of our universe, surely we can explore the innermost regions of our own cells, those cells which by heredity or environmental influences or both produce errors which curtail life. Naturally, we will not be able to do so in a day, but as God has given us one day at a time, we will use each and every day to overcome disease. 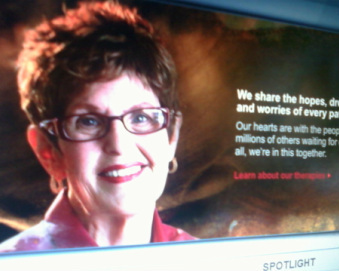 That is the destiny of this generation, and we will conquer cancer. 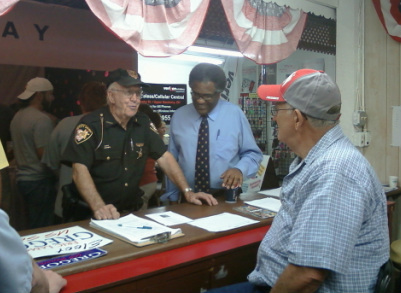 Wyandot Republican Chairman, Sherman Stansbery (seated), Wyandot County Deputy, and US Senate candidate Eric LaMont Gregory enjoy a quip about the relations with that other party, approached as one would expect in Wyandot County, in a friendly and neighbourly manner.